There a billions of different outcomes of the 2018 FIFA World Cup™ and it is hard to get an overview on who is going to play against who in the different stages of the tournament. Most forecasts models only give the most probable outcomes. However, if this forecast is wrong at some stage (this will happen with a probability close to 1!) all other forecasts for later stages are useless. For example, let us consider a model predicting that Germany and Brazil will both win their group. If then one of the two teams do not win their group all games involving group E and F in the knock-out phase become useless. One way out of the dilemma is to forecast all different outcomes of the tournament and assign probabilities to each outcome. 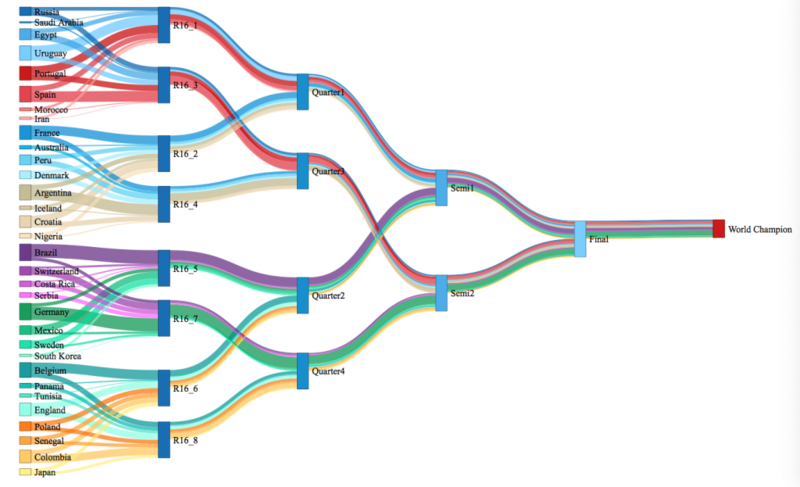 This is done in the following Sankey diagram. Please click on the graphic to obtain an interactive java script version. In this version you can move the different “sites” and hover over the “links” to see the corresponding probabilities. In this way you can “zoom in” the parts you’re most interested in. The above forecast relies on a statistical model that is based on the matches of the participating teams since 2010. It allows us to simulate each game dynamically in dependence of each team’s individual strength and weakness in attack and defence; for more details see A more sophisticated forecast model. The following table gives the estimated probabilities for each team to reach a certain round or win the world cup.